As the world celebrated the date of the first human being traveling to space on Wednesday, the Russian movie about space exploration "Time of Pioneers" premiered in Washington, DC. WASHINGTON (Sputnik) — Produced by Timur Bekmambetov and directed by Dmitri Kiselev, the drama "Time of Pioneers," which is being screened at the Russian Embassy in DC, tells the story behind the iconic footage that was released to the world in 1965, when Alexey Leonov became the first human being to step out into open space. Russian ambassador to the United States Sergei Kislyak sent a special message, read by the embassy representative, on the occasion of the premiere on Wednesday. The Russian ambassador added that Americans deserve “special credit” as they came up with an idea to celebrate the event under the brand Yuri's night. The current event, Kislyak added, forms part of this global initiative. Some 300 people attended the premiere including American students and representatives of various diplomatic missions. The movie, set in the 1960s, during the Cold War-era space race between the Soviet Union and the United States, shows the true story of the adverse and life-threatening situations Leonov and fellow cosmonaut Pavel Belyaev faced during and after Leonov's legendary first spacewalk on March 18, 1965 from the Voskhod 2 spacecraft. 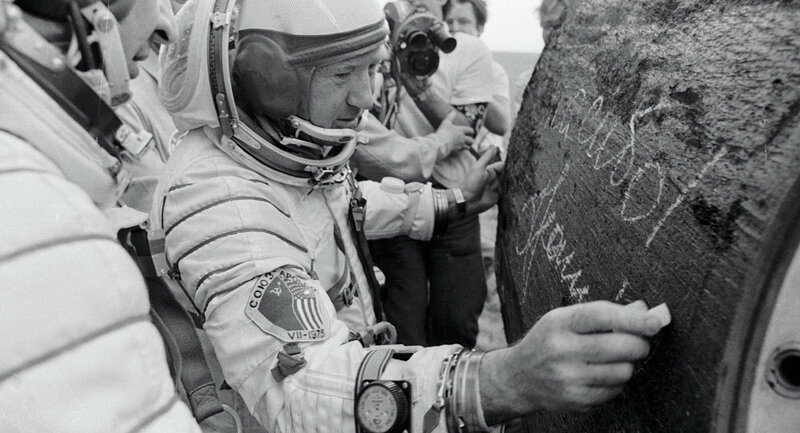 The drama shows the close calls and even life-threatening emergencies that the cosmonauts faced during their flight, and upon their return to Earth, including Leonov's troubles returning to the spacecraft following his spacewalk, and problems during reentry, when Leonov and Belyaev ended up landing in the unhospitable taiga, from which they had to be rescued. The film highlights the limits to technology, and humanity's limited understanding of conditions in space at the time, which made the cosmonauts' effort a truly heroic undertaking. Russian actors Yevgeny Mironov and Konstantin Khabensky played the roles of Leonov and Belyaev respectively. The movie was released on Thursday and topped the country's box office over the weekend, according to Russian film portal kinobusiness.com. Earlier in the day, Russian President Vladimir Putin was joined by Leonov and first woman in space Valentina Tereshkova for a special screening of the space biopic "Time of Pioneers'’ (or alternatively translated 'Time of Those Who Came First' or "The Time of the First Ones). On April 12, 1961, a booster rocket took into orbit the Vostok spacecraft with the first cosmonaut on board — Soviet citizen Gagarin. Having traveled around the Earth once, the reentry module landed on the territory of the Soviet Union. On April 7, 2011, the UN General Assembly proclaimed April 12 as the International Day of Human Space Flight on the occasion of the 50th anniversary of the first space flight by Gagarin. The resolution was co-authored by more than 60 UN member states.